Just six months after we first had the idea of taking a Round the World in 40 Days journey, we have now completed Stage 1, a spectacular Golden Triangle tour of Agra, Jaipur and Delhi in India. Our epic round the world journey started on a cold, wet afternoon at Manchester airport. I’ve always been happy flying with Emirates and the flight from Manchester to Delhi, with a brief stop in Dubai, was no exception. Overnight travel is never fun, but at least we could book our seats well advance through Emirates at no extra charge – unusual for airlines nowadays. The four of us – myself and wife and STE’s Photo Editor, John Esser, and his wife – opted for upper deck economy seats on the Airbus A380. The service is better on the upper deck and often you can get off more quickly than from the much larger lower deck. We were met at Delhi Airport by the courtesy car from the Crowne Plaza Okhla hotel. I can strongly recommend this hotel for its helpful and efficient staff and high standard of rooms. As IHG Rewards Elite members, we were given upgraded rooms and Club Lounge access with complimentary breakfast. We had booked a private (i.e. just the four of us) three day Golden Triangle tour through Expedia (check under Things to Do). This tour was operated by Le Passage to India. 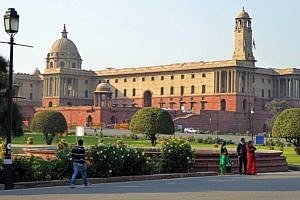 A slight problem was that the Taj Mahal is closed on Fridays, the day we should have visited. 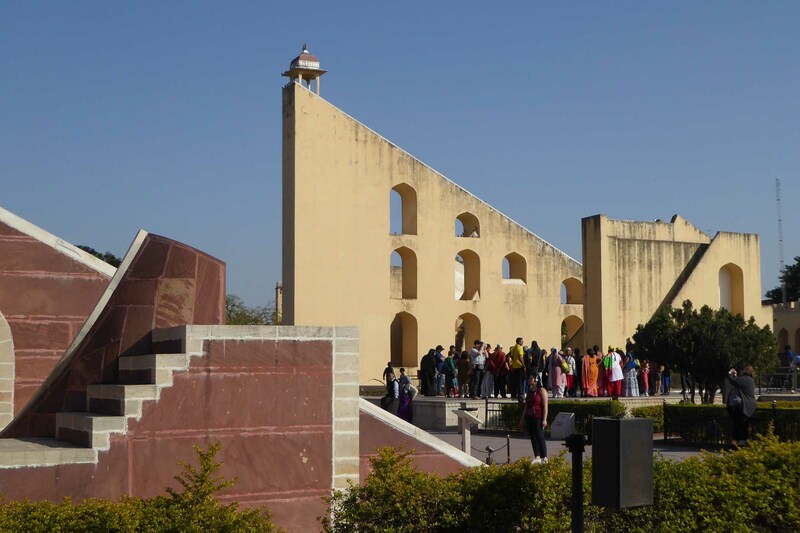 However, our organiser at Le Passage to India, Ms Neeru Bhatia, managed to arrange the trip the opposite way round to normal in order to take this into account. Our tour vehicle was a 10-seater coach with good air conditioning. 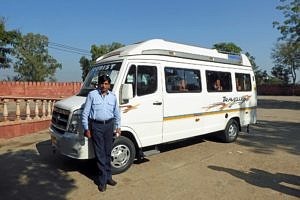 Our driver was very skilful amid the sometimes chaotic traffic and the guides at each site were helpful and informative. 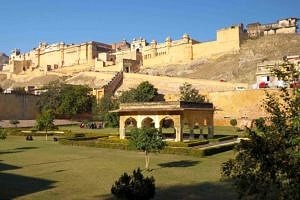 The Golden Triangle tour cost about £250 per person including two nights hotel accommodation along the way and all entry charges; this proved excellent value and the tour is thoroughly recommended by all four of us. The Taj Mahal was at the top of all of our bucket lists and it most certainly didn’t disappoint. We were concerned as we travelled from Delhi to Agra (about 150 miles) that the thick mist that reduced visibility along the way would spoil our view of this modern Wonder of the World. 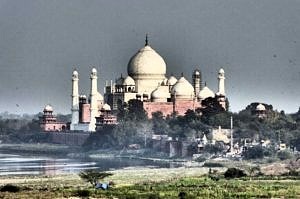 However, the mist had almost disappeared by early afternoon when we arrived in Agra and the Taj Mahal could be seen in all its ivory-white marble splendour. Maybe the scaffolding on one of the minarets spoiled our photos a little, but viewing is of course far more important than taking photographs! The whole Taj Mahal complex, with its avenues of trees and fountains and decorated gates and pavilions, kept us spell-bound for almost the whole afternoon. 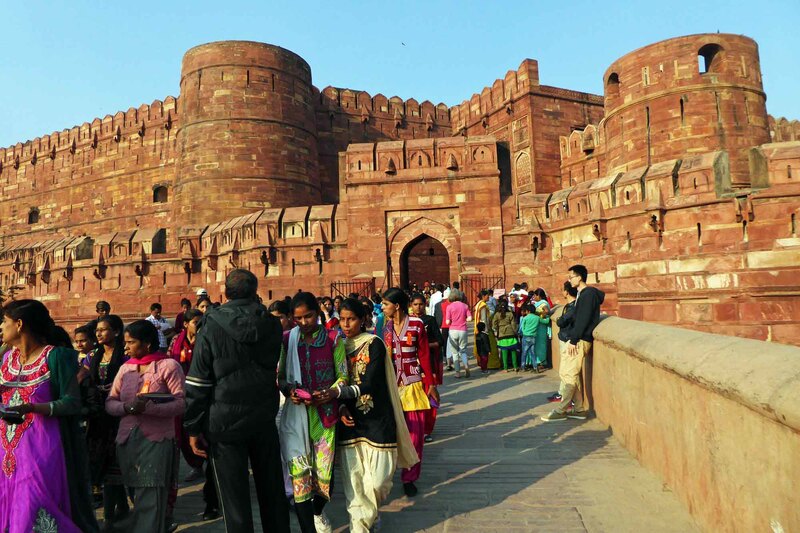 The military might of the Agra Fort just a couple of miles away along the Yumana river contrasted sharply with the romantic beauty and delicate decorations of the Taj Mahal. 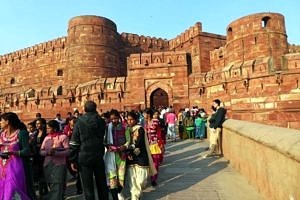 The colossal red sandstone gates opened up to palaces and pavilions, many providing breath-taking views of the Taj Mahal as the sun set over the city. 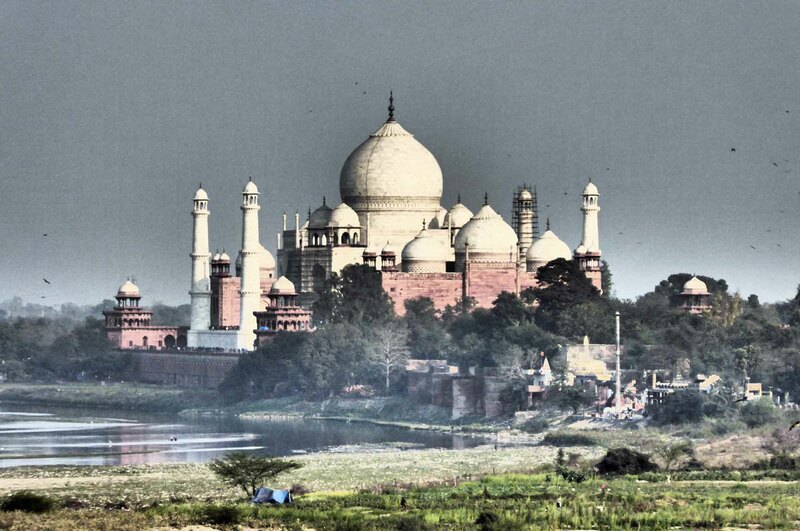 This is the view the Mughal emperor Shah Jahan had for 8 years of his beloved wife’s resting place, the Taj Mahal, before finally being laid to rest there beside her. 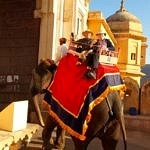 After another 150 mile drive we arrived at the ‘pink city’ of Jaipur. 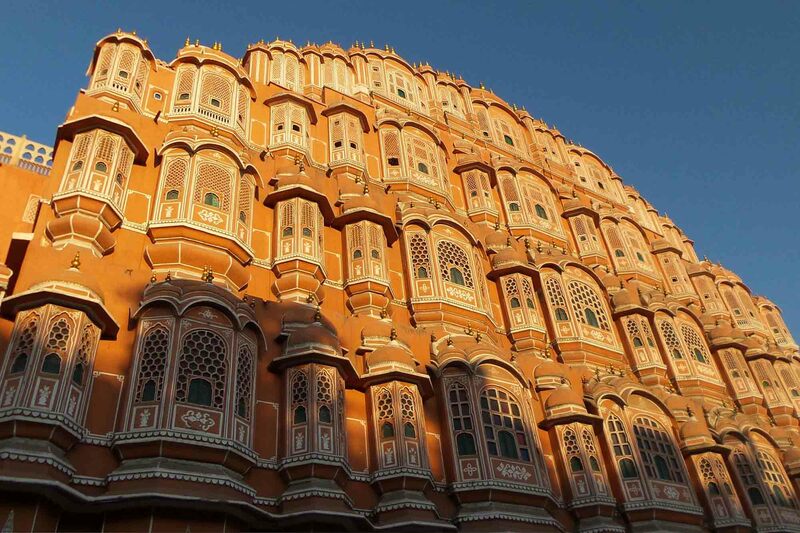 And indeed virtually every building is painted in a terracotta pink colour – quite dazzling. 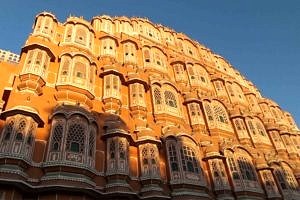 There is much to see in the city including the massive Palace of the Maharaja, part of which still serves as a royal residence, and the striking pink sandstone Hawa Mahal palace, which is essentially just a high screen wall. Near by the Jantar Mantar Observatory contains nineteen fascinating astronomical instruments, many built on a vast scale. 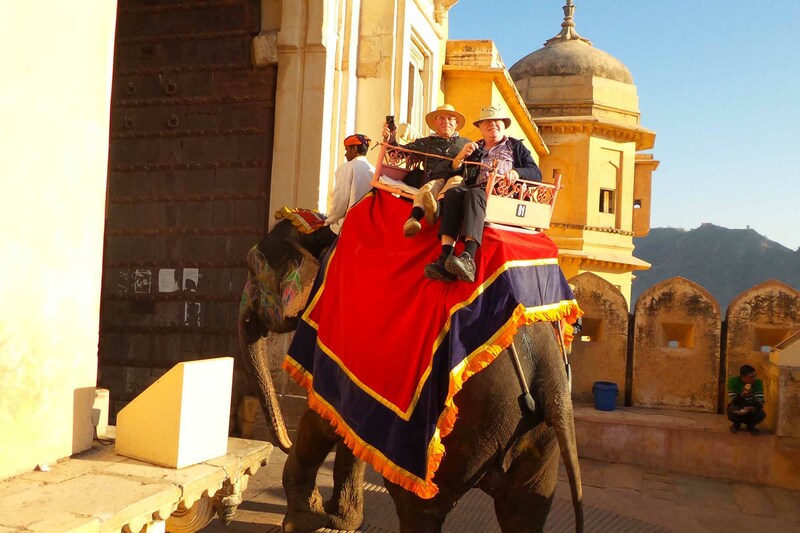 The highlight of our visit to Jaipur had to be the elephant ride up to the Amber Fort (also known as the Amer Fort) just outside of the city. Although rather precariously balanced on these great beasts, particularly when trying to take photographs along the way, the increasingly panoramic views back across the Moata Lake made it all very worthwhile. 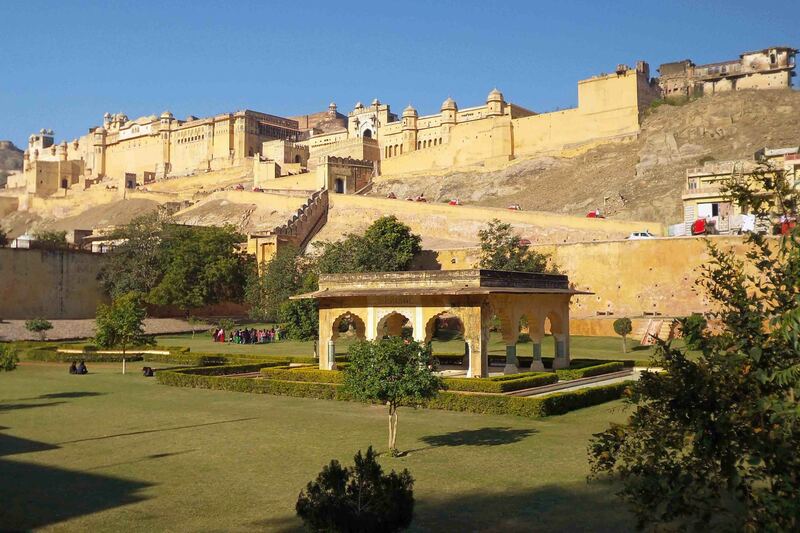 That’s not of course to take away from the magnificence of the interior of the fort itself with its courtyards and pavilions and intricate decorations with embedded precious stones. A final 170 mile drive back to Delhi completed the Golden Triangle. Taking the tour the opposite way round reduced the time we could spend touring Old and New Delhi, however, we still got a flavour of this remarkable city with it’s great contrasts. 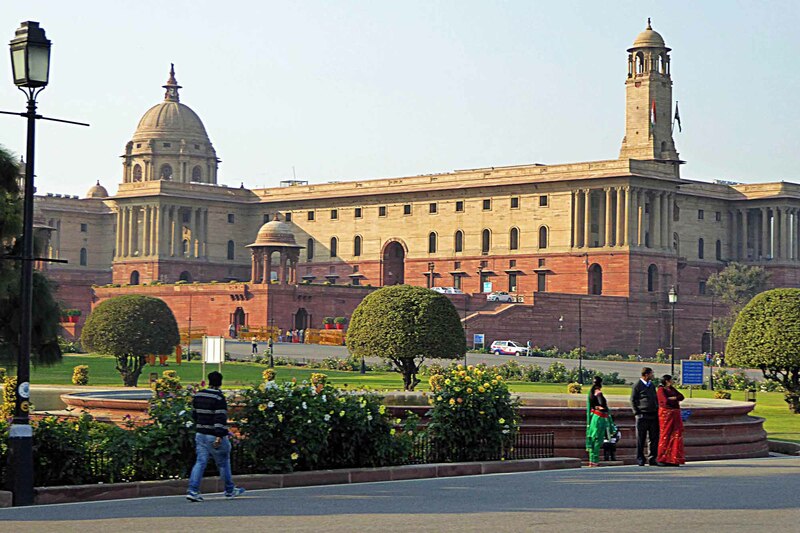 From teaming, bustling narrow streets and ancient monuments like the 12th Century Qutub Minar tower, we travelled to the wide boulevard of Rajpath leading to the India Gate war memorial and Luytens-designed cream and red sandstone government buildings. The three day tour presented no problems for us senior travellers. The tour coach took us directly to all the sites we visited with relatively little walking and with no long waits in queues. Often, maybe because of our age, we were urged to move to the front of queues. We always found a very pleasant, friendly atmosphere and were surprised that many local people, from schoolchildren to soldiers, wanted to be photographed with us. After a final night at the Crowne Plaza Okhla, we set off for Stage 2 of our epic journey – the island state of Singapore.